The museum is housed in a neo-Renaissance building that was built for the former Museum of the Royal Capital City of Prague. The exhibition presents the history of the Prague territory from prehistory to 1784. A very special museum exhibit is the Langweil model of Prague built from 1826–1834. It is a unique depiction of the appearance of the Old Town, Lesser Town and Prague Castle at the turn of the 20th century. 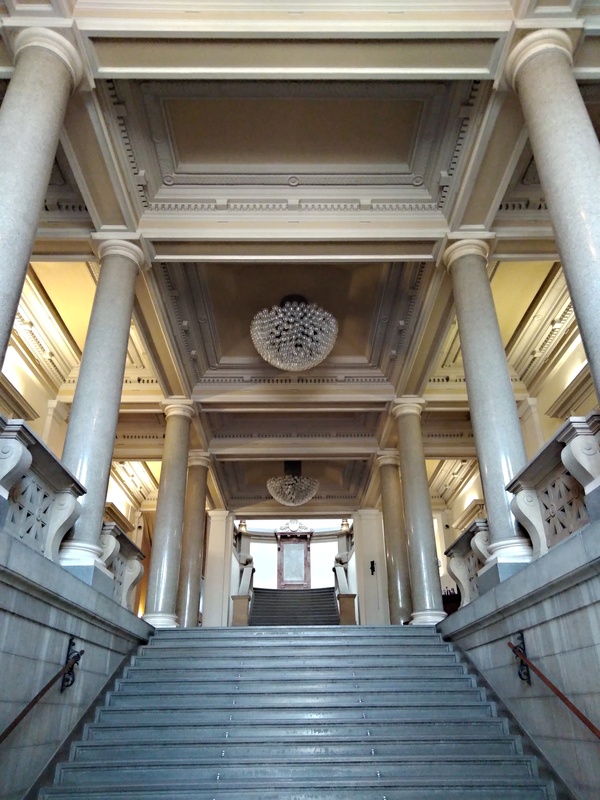 During Easter holiday 2019, The City of Prague Museum - Main Building is opened. The second half of the 19th century was a period when many buffs, patriots and those interested in history and natural science founded various museums. The City of Prague Museum started its operation as the third museum in Prague in 1883. Establishing of the Museum was first discussed by the City Council in 1877. Wácslav Wladiwoj Tomek as the head of the commission for ideological content and practical location of the museum, dr. Miroslav Tyrš as the head of the first committee of the museum, which collected first, then still small museum collections, as well as its first director, archaeologist and historian Břetislav Jelinek were the men, who contributed greatly to its establishing. Collections were eventually placed in the former cafe building in the Na Poříčí town park and thus in 1883 the The City of Prague Museum was founded. The Café pavilion was built by František Saller and Jan Beninger in 1878 but its premises were soon insufficient to accommodate growing collections and therefore the project of a new building was ordered with the architect Antonín Wiehl. However, he gave up the task and the project of the neo-renaissance building was developed by Antonín Balšánek. The new building was attached to the old café pavilion and the construction works lasted from 1896 to 1898; the museum was opened to the public in 1900. In the middle of the main facade of this spectacular building there is the raised buttress topped with the tympanum, in which the relief by Ladislav Šaloun themed "History, science, arts and crafts are the glory of our past” is placed. The highest peak of the tympanum is fitted with the allegorical figure of Prague by Šaloun from 1896. This statue was shot down by a German tank during the 1945 May revolution. In 1985 Miloslav Šonka made its copy by the model found in the estate of Šaloun. Another plastic decoration of the building was made by the sculptor František Stránský (allegory of Christianity and Paganism), sculptor Vojtěch Šaff (Prehistory, History, Monuments) on the rear facade and sculptor František Hergesel (History) on the side adjacent to Karlín. Here, there is a big sign of the City of Prague by O. Šmejkal. In the interior there is stucco by Vilém Amort and sculptures by Ludvík Wurzel, František Hergesel and Antonín Procházka. 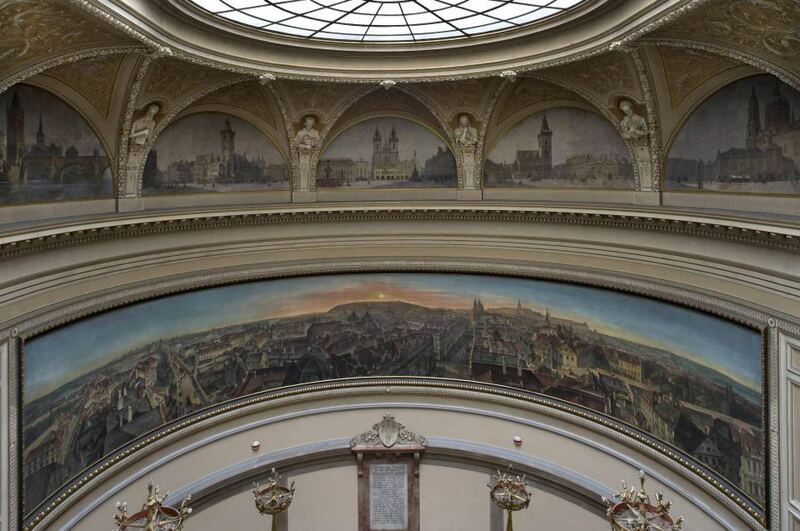 Above the staircase landing there is the Prague panorama by Antonio Sacchetti. Above there are seven views of Prague by Karel Liebscher and Václav Jansa. The collections of the museum contain a number of interesting and historically and artistically valuable objects from various fields of human activity, documenting the historical and cultural development of the city from prehistoric times to the present day. The museum has extensive archaeological collections, a collection of decorative arts, porcelain, furniture, one of the largest collections of guild monuments in Europe, collections of works of art from the unique Gothic wood carvings through Baroque wood carvings to the collection of drawings and paintings by painters of the 19th and 20 century, who captured the transformation of Prague. It includes the collection of works by Josef Manes, including the original of his calendar plate of the Old Town Astronomical Clock and rare vistas of Prague, especially the extensive collection of works by Vincent Morstadt, as well as the photography collection. The Prague model by the painter Antonín Langweil from the years 1826 – 1834, unique for its documentary and artistic value is really famous. The exact model spread on the area of 20 m2 depicts thousands of houses with every detail on the facade, with accurate colours, made with plastic arcades, with drawn graffiti and the exact number of windows, doors, statues and other details. Mostly hard cardboard with drawings on paper was used but the author also used wood and other materials. 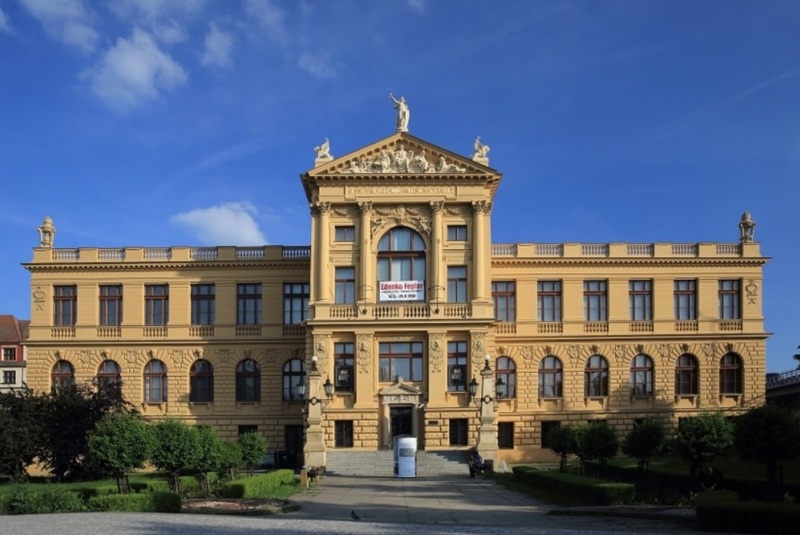 In addition to the main museum building there is an open exposition in Výtoň with the history of Podskalí exposition, the history of Vyšehrad exposition located in Vyšehrad and several other depositories. In 1941 Dejvice Archaeological Museum, founded by J. A. Jíra at Hanspaulka mansion was transferred under the administration of the museum. This exposure had to be cancelled in 1960s to make room for the huge number of artefacts, which were discovered during archaeological excavations in connection with the construction of the metro.